February is carnival time. The last day of Carnival, (Shrove Tuesday) falls on the 9th of February this year. In all the bars and pastry shops in Florence now you will be able taste some wonderful goodies that are not available at any other time of the year: Cenci (fried dough smothered in icing sugar), Frittele (fried little rice balls packed with sugar and sometimes raisins, or custard and even chocolate) and then the ubiquitous Schiacciata alla Fiorentina (a melt-in-the-mouth sponge cake drowned in sugar and often filled with custard or whipped cream). 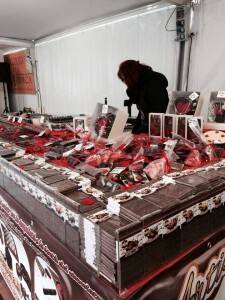 And as if that wasn’t bad enough, the Chocolate Festival is taking place in the Santa Maria Novella piazza just behind where our restaurant is located. From the 12th – 21st of February you can taste some of the most amazing chocolates to ever have been invented. The website is only in Italian, but click that sneaky translate button in your browser to get the low down! Let’s be very honest here. If you are still worried about that post-Christmas extra flab, Florence in February is NOT the place to be!